A: The experts will wash your casements with risk-free water-fed pole tool or use secure ropes and cherry pickers to clean high-rise premises. We also offer inside window cleaning in Plumstead, done with the usual ladders and squeegees. A: This handy allows the Plumstead window cleaners to treat any skylight, sash window, French door, and other pane types on any four-storey home or office. A: It's simple – we won't wash your windows with regular tap water. Instead, the pros will remove the dust build-ups with distilled water that won't mar your panes once it vaporises. Q: Do I need to prepare in advance for the Plumstead window cleaners' arrival? A: You'll need to find an empty parking space within 30 metres from your domain and on the same side of your street. You'll also need to provide the specialists with full access to your property. A: We will happily clean any four-storey or multistorey commercial premises. We can also offer you with other maintenance options, such as gutter cleaning and pressure washing. With the efficient water-fed rod cleaning tool, the experts can help you overshadow your competition at fair fees. And you can lower our window cleaning Plumstead rates even further by mixing two or more of our washing services together! To find out the exact numbers behind our price offers, make sure to head over to our convenient price table below. 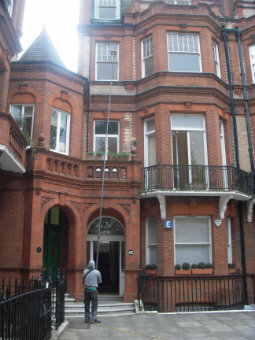 We've developed our window cleaning in Plumstead with flexibility in mind. As a result, our service is now frequently booked by commercial and household customers alike. Let's review our window cleaning options on offer. With our outside cleaning, you can deftly polish the panes of any building with four or less floors. The practiced technicians will arrive in a cleaning vehicle. The window cleaners in Plumstead will then link a handy water-fed pole to the van's water storage. The special refined water will be released through a brush-head attachment at the pole's end under enormous pressure. When the liquid disappears under the sun, your glass façade will stay spotless for weeks to come. For properties above the fourth floor, we'll send in practiced abseilers for rope access window washing. Equipped with durable ropes, cherry pickers, and ladders, they will evaluate and refresh any skyscraper in a matter of hours. Should you request risk assessment reports, we'll gladly provide them for you. We also take our job very seriously and will follow all safety regulations. If your panes are muddy on the inside as well, the specialists can carry out interior cleaning with ladders and squeegees. Do any of your friends need help with rinsing away resistant window stains? Continue reading to learn which areas the Plumstead window cleaners can visit. Alternatively, get a free instant quote or order affordable window cleaning services Plumstead SE18 online, through our web site.